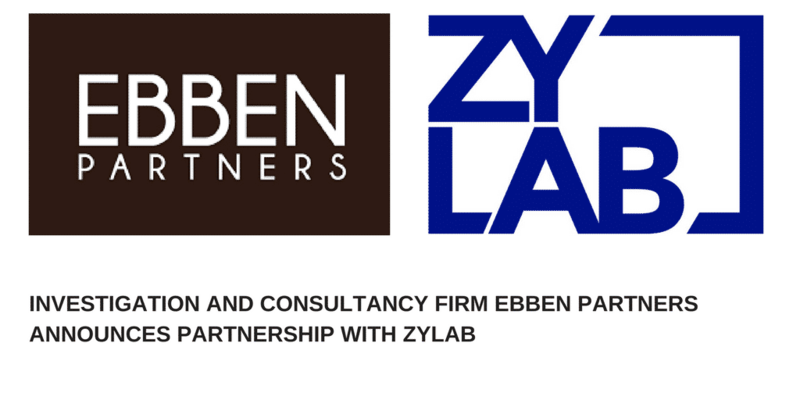 Amsterdam, 19 October 2017 – EBBEN Partners, an independent research and consulting firm, is announcing a strategic partnership with ZyLAB, leading provider of innovative eDiscovery solutions. EBBEN Partners specializes in issues regarding fraud, integrity, governance, risk and compliance. The research and consultancy firm will use the advanced eDiscovery technology of ZyLAB for data investigations in their fields of expertise. In addition, EBBEN Partners will deploy ZyLAB ONE eDiscovery for more preventive investigations such as investigative due diligence, internal audits and compliance audits. Besides using the standard ZyLAB ONE eDiscovery-platform, EBBEN Partners will develop special libraries and best practices on this platform to realize an even higher level of automation and productivity in their investigations. As part of this process, the ZyLAB ONE-certified professionals from EBBEN Partners will work closely together with ZyLAB’s specialists, combining technology with specialist research expertise. The use of ZyLAB ONE eDiscovery will bring the research and consultancy firm significant efficiency improvements in its large-scale data investigations in the areas of accountancy, advocacy, integrity and security. ZyLAB offers its advanced eDiscovery technology through legal SaaS platforms that can be deployed cost-effective and per-case.